Oh dear. It's been a monstrous event here. I sent Pierce to school with a monster in his lunch box. I told him to be very careful in opening it, and to eat it quickly, before it had time to bite him. As if the monster weren't insult enough (just look at that disgruntled face) you may also notice that there is an eight eyed, eight legged spider with huge fangs (made from an orange - which you can't really tell in the picture). I tried to make up for all these evil lunchbox invaders by a heart shaped homemade cheese danish (those are pecans on top) and some docile barbecued corn nuts. 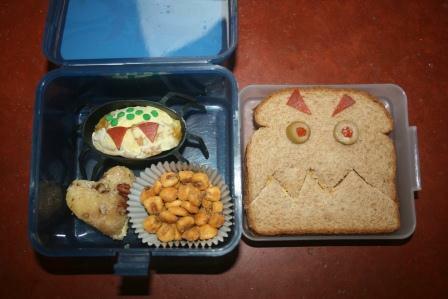 Anything scary in your lunch lately? For more cute kids' lunch ideas, check out Muffin Tin Mom. Hey that's a great way to diet Lisa. Scare yourself thin! we attended a "pot-luck" lunch recently and while I'd stop short of calling anything there monstrous, I will say we were not very "lucky"
This is too cute. I love the monster sandwich. Adorable! One of my favorties of yours! I bet he loved it! I love the monster! I LOVE the monster! He's so grouchy he's cute! That would be a great one for around Halloween. That is just the cutest little monster! It reminds me of the monsters in a book I used to read the kids! Those are just WONDERFUL! I miss having little kids around *and* I would like to invite you to my great new giveaway for two brand new cookbooks and a Real Women of Philadelphia souvenir apron!Pop by my blog and leave me a comment for your chance to win! Definitely nothing that creative. How fun. Nicely done Lisa. TOO COOL!!!! I will have to try the sandwich for the girls, they will LOVE it! This is so cute! I love the monster sandwich! I bet Pierce's friends think he has the coolest mom! What a great idea Lisa, a good way to make healthy snacks. Cool sandwiches, and I love the spider. This is one of my favorites! I LOVE it! Super cute! How cute! My son will definitely love this! Lisa: My packed lunches as a kid were dull by comparison! I always look forward to Mondays to see what Pierce had for lunch! roflol Way cute! Another adorable lunch. Love the monster sandwich!! That sandwich might possibly be about the cutest errrr I mean scariest thing I have ever seen!!! hi lisa, that is really awesome, love the monster sandwich!! and thank you for yous kind get well wishes for my sister. much appreciated. Your creativity is amazing. The sandwich looks great.